Asti is one of those wines that I can't help be lifted by. It's so sweet, smooth, fun and tingly that I don't know how you can't obtain a smile from it. 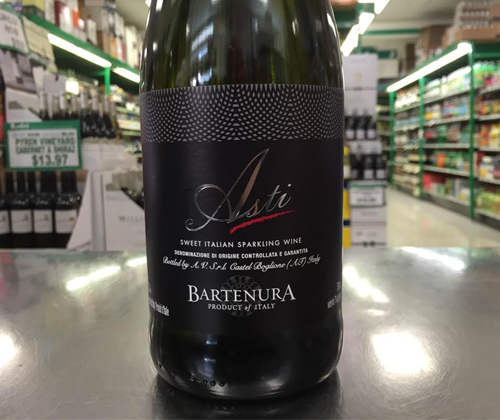 Asti is actually 100% Moscato, made sparkling through partial fermentation, from the Italian wine region of Asti in northwestern Italy. Bartenura's wines are all kosher. As a tribute to Jewish heritage and Italian winemaking, the winery was named after the hometown of Ovadia ben Abraham, who was best known for his study and writings on the Mishnah. One of the benefits of drinking Asti, or any kind of Moscato, is that it's low in alcohol and this one only has a 7% ABV. That means there's more expressive peach and apple aromas and flavors for you to enjoy before you need to call it quits. It's an excellent way to celebrate anything and goes great with cheese and crackers. I LOVE CHEESE AND CRACKERS!